When it comes to grease trap cleaning and collection, restaurant owners and operators trust the experts to get the job done right. Total Septic Service brings their skills, experience and precision to ensure your grease trap will be clean, clear and running proficiently. Contact us today for your grease trap cleaning and collection needs throughout the Quad Cities, Eastern Iowa and Western Illinois. 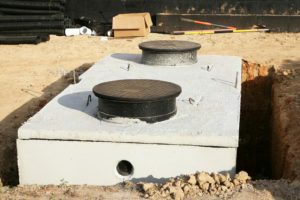 The function of a grease trap, also known as a grease interceptor, is just that – trapping grease. This is very important, especially for commercial businesses, like restaurants, that dispose of a lot of grease. Grease, made up of fats and oils, has a lighter density than water. This results in the grease not mixing with water, but floating on top. As the wastewater enters the trap, the grease at the top is caught, while the water continues flowing through to the next treatment system. If grease is not caught in a grease trap it flows directly into your pipes and treatment systems. Grease, once it cools, solidifies into a solid. If this is allowed to flow unchecked into pipes it causes those pipes to become clogged and back up. This can destroy your entire waste system, damage your property, and even have negative effects on the environment. Once your grease trap has been cleaned, the grease must be disposed of. Total Septic Service not only cleans your grease trap, but takes care of the collection and disposal of the grease as well. With Total Septic Service you get the total package! Restaurant owners and operators can depend on us to help them stay in compliance with all local statutes. We show up at the appointed time, efficiently clean your system and properly dispose of your brown grease. We will additionally complete all necessary documentation to ensure you stay in compliance with all local regulations. Servicing customers throughout Davenport, Bettendorf, the Quad Cities, Eastern Iowa and Western Illinois. Contact Total Septic Service today and let us help you stay in compliance! To view our service area CLICK HERE.